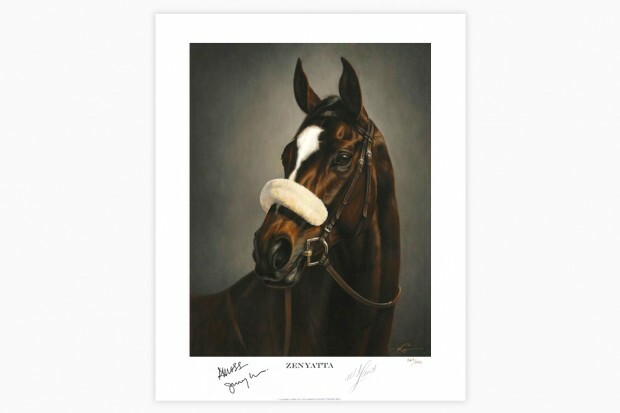 Zenyatta by Jaime Corum is available today at the Zenyatta Shop. This limited edition print is hand-numbered and signed by the artist. View all details here. It is also available in collector’s editions, signed by Zenyatta’s owners, Jerry and Ann Moss, as well as Hall of Fame jockey Mike Smith. Shop our new Collector’s section for signed and limited edition pieces. Kudos to Mike Repole for reclaiming the 10 year old gelding “Be Bullish” yesterday. According to reports he has retired this great old gelding to the NY division of Old Friends. I have visited both the KY division and NY Division of Old Friends and they are so caring for these great old warriors. We need more owners like this! Wonderful story. My dear Z-ster friends, Sandy NE Ohio, Ann NC, Max, Terry Crow, Kathy, Sheena, Marty, Debbie S, Debbie G, DMCQ, Barbara Wood, Bluegrass Girl, Elizabeth in NM, Peggy (N) South Georgia, Sally B, Marshall (NC Broad), thank you for so kindly remembering me on my birthday despite my having been AWOL on the Blog recently. I hope I didn’t leave anyone out. Your greetings are much appreciated. Please be assured that even when you don’t see me here, I hold you and all the Z-sters close in my heart. There will never be a finer group of people than the Z-sters, and it has been an honor to get to know you through Zenny’s Blog. We all owe Zenyatta for so much, don’t we! High hoof! Let me extend belated best wishes to others who have celebrated birthdays in the last couple months, including Lisa B, Stephanie in San Diego, Sue Fredrick, Sue W, GirlSaratoga, DMCQ, Rosemary McCauley, Virginia in So Cal, Llny in TX, Pam Homeier, Judy Berube, Kathy, Sally B, Nancy in NJ, Sheena, Bobby Elkhorn, and Judy from Pahrump, Nevada. Also, best wishes to Peggy N a little in advance of her birthday coming up on May 29. Finally, congratulations, Marty, on your new canine companion, Tanner! I’m so happy for the two of you. PS A big oops to Judy Berube– I didn’t mean to leave you out, dear friend. I don’t know how that happened. Please forgive me.